During the mid 1880's the sweet pea became established as a popular garden plant and various plantsmen experimented with cross pollination and introduced new varieties. However, it was the work of a Scotsman, Henry Eckford, living in Wem, Shropshire who secured the future of the sweet pea. By skilfully crossbreeding he produced many new varieties, in new colours, with improved flower size and length of stem. These varieties produced by Eckford are known as the ‘grandiflora’ or ‘old-fashioned’ sweet peas, they became very successful commercially as cut flowers and were widely grown by horticulturists for exhibition. By 1900, sweet peas had gained tremendous popularity. Compared to the wild or original sweet pea varieties, the Grandifloras usually have clearer colours on the petals, they tend to bear more flowers on the stem and are more fragrant. The development of varieties with larger flowers and an aesthetically improved placement of the petals on the stem, with standards borne at a greater vertical angle and with the wings held more evenly made for much better display plants. Originally bred and introduced by an amateur horticulturalist, Mr Viner in 1901, Sweet Pea 'Nellie Viner' produces long stemmed blooms that have nicely rounded clear pink flowers and is also blessed with the most superb fragrance. In the vase 'Nellie Viner' is a very useful pink, that blends beautifully with more delicate shades such as the blues of 'Lady Grisel Hamilton' and lilac and blues of 'Erewhon', or can be used as a contrast displayed with the darker purple tones such as 'Black Knight'. Each flower has a hooded standard with usually three, occasionally four blooms to each stem. The long-stemmed sprays produce an irresistible medley of fragrances and make exceptionally fine cut flowers. Sweet Peas are very easy to grow. You can simply plant them in the soil where you intend them to grow in March or April (be guided by local weather conditions) and leave them to it. By July you should have flowers. However, to get the best from your seeds you should consider planting them indoors in autumn (late September to early November) or winter (January to February). This will enable you to have stronger and earlier flowering plants. Flower production is usually around two to three months from planting out. If you have a reliable source of John Innes seed compost, or for spring sowing John Innes No 1 potting compost, these will be eminently satisfactory for sweet peas. J.I. Nos 2 & 3 are too strong for sweet peas and should be avoided. Germination of sweet pea seed is often quicker and more uniform if the seeds are soaked in water for 24 hours prior to sowing. This also enables you to identify any seeds with hard coats, which fail to swell during this period. These should have the seed coat nicked with a small file to enable them to take up water. Sweet peas seeds can be sown indoors in late autumn to early winter into rootrainers or long thin pots. They can also be sown indoors in spring and planted out in April to May. If you are planting in January to February your seedlings may need a little gentle heat to germinate. Make sure you stop the heat as soon as germination has occurred, otherwise your plants will get leggy. Do not overcrowd the seeds, push one or two well spaced seeds about 2.5cm (1in) below the compost surface. When roots fill rootrainers, pot on two seedlings into a two litre pot. A temperature of 18 to 20°C (65 to 68°F) will give rapid, even germination. As soon as the seedlings have emerged, they need to be grown as cool, and with as much light, as possible. Pinch out the tips when plants have three or four pairs of leaves. Over-winter undercover in a light, cool place. Plant out - two plants to a vertical in a mild spell in March. Tie them in every week to encourage straight stems. Sweet peas can also be sown direct into the open ground where they are to flower. The best time for this is mid March to early April, depending on the weather and the locality. Sow 5 to 8cm (2 to 3in) apart, about 3 to 5cm (1 to 2in) deep. Thin the resulting plants to an average of 15 to 20cm (6 to 8in) apart. Slugs and mice can be a real problem on a direct sown crop, so take suitable precautions before you sow. Choose an open site which gets plenty of direct sunlight, but which has some shelter from the worst winds. Avoid planting close to an established hedge or where there will be competition from tree roots. Young seedlings can be prone to disease if over watered, but once the crop is in full growth, a copious supply of water is needed. A well prepared site will pay dividends by having considerable reserves of available moisture. It is essential to encourage a strong root system if high quality flowers are to be achieved. Balanced fertilisers are safest, particularly tomato feed. Never apply heavy dressings of fertiliser to weakly growing plants - invalids need gentle coaxing back to health. Foliar feed can be useful for plants with root problems, but frequent sprays of very dilute fertiliser will be needed to have a significant effect. If you would like to bring some Sweet peas out of the garden and into the house, there are some simple steps to follow to ensure that they will last a little longer in the vase. The cut flowers have a vase life of 4 to 5 days. Pick sweet pea flowers early. The blooms should be picked before the flowers are fully open. Wait until the lowest blossom on the stem has just started to open. Burn the stems. Place the base of the stems in a naked flame (a candle is fine). Alternatively, place them into boiling water for a few minutes. Stand them in a vase immediately, the vase should be filled up to the neck of the stems with cold water. Sweet peas tend to give off a lot of ethylene, which promotes their demise. Store cut sweet peas in a cool, well-ventilated area. To prolong flowering ensure that the flowers do not set seed and keep picking as often as you can, this will encourage the plants to set more blooms. The species name odorata means 'fragrant' or 'sweet-smelling'. Sweet peas are in the in the family Fabaceae, the legume family. The older Grandiflora varieties were originally developed around 1900, many by Henry Eckford , they are often referred to as Old Fashioned, Heirloom or Antique sweet peas. While the Spencer varieties were developed around the 1950's by Silas Cole, head gardener for the Earl of Spencer at Althorp (the family of Diana, Princess of Wales). Lathyrus odoratus, is believed to be native to the eastern Mediterranean region from Sicily east to Crete. Many places have been suggested as being the home of the original sweet pea stock, among these the Italian island of Sicily, the island of Malta, China and Sri Lanka have been be mentioned. Though it is not known exactly where the sweet pea originated, one historical aspect concerning the sweet pea is agreed on by most people. 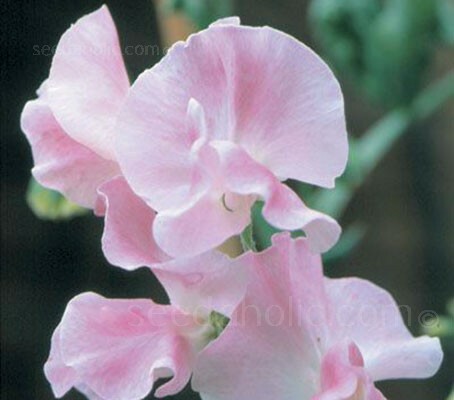 It is known that Francisco Cupani, recorded the sweet pea as being a new plant in Sicily way back in 1696. Sweet peas have a fascinating history. It is believed that the original seeds were harvested and cultivated by a Sicilian monk, Father Francis Cupani. He recorded the intensely scented wild sweet pea as being a new plant in Sicily in 1695. To modern day standards the flowers would have been fairly insignificant to look at, just one or two small blooms on a slender stem (not unlike the flower on a vegetable pea) in just one colour (maroon with bluish purple leaves). The species redeeming feature was its captivating fragrance, which presumably lead to its popular name "the sweet pea". Francis Cupani sent seeds to a Dr. Uvedale in Enfield in 1699 and seed was offered for commercial sale from 1730 and by the end of the century five different colours were available, probably resulting from spontaneous mutations from the original. During the mid -1880's the sweet pea became established as a popular garden plant and various plantsmen experimented with cross pollination and introduced new varieties. However, it was the work of a Scotsman, Henry Eckford, living in Wem, Shropshire who secured the future of the sweet pea. By skilfully crossbreeding he produced many new varieties, in new colours, with improved flower size and length of stem. These varieties produced by Eckford are known as the ‘grandiflora’ or ‘old-fashioned’ sweet peas, they became very successful commercially as cut flowers and were widely grown by horticulturists for exhibition. By 1900, sweet peas had gained tremendous popularity. Compared to the wild or original sweet pea varieties, the Grandifloras usually have clearer colours on the petals, they tend to bear more flowers on the stem and are more fragrant. The development of varieties with larger flowers and an aesthetically improved placement of the petals on the stem, with standards borne at a greater vertical angle and with the wings held more evenly made for much better display plants. At the turn of the 20th century the most celebrated new form of sweet pea was discovered as a natural mutation by Silas Cole, head gardener for the Earl of Spencer at Althorp (the family of Diana, Princess of Wales). Cole grew and loved lots of Henry Eckford varieties and amongst a row of an Eckford variety "Prima Donna" he noticed one remarkably different plant, the sport was so exquisite, with its wavy and frilly petals, he allowed the plant to set seed and the following year selected out those plants which retained the new form. The result was the first Spencer sweet pea ‘Countess Spencer’. He exhibited the variety at the National Sweet Pea Society's first show, at the Royal Aquarium in 1901. Curiously, an almost identical sport appeared in several other gardens simultaneously, but Cole’s work and the name of the Spencer family ensured that his introduction in 1901 received the lion’s share of attention. The ‘grandiflora’ or ‘old-fashioned’ sweet peas have come back into popularity in recent years. Modern sweet pea varieties are only moderately scented and for intense full bodied perfume, many seed breeders have gone back to the pre-Spencer types. The flowers are smaller and less frilly than the Spencers but all varieties are beautifully fragrant. Spencer types have much larger, wonderfully ruffled upper or "standard" petals, longer lower "wing" petals and much showier blossoms overall. They come in a wide range of colours and have large flowers with four to five blooms to a stem and are the first choice for exhibitors. New varieties are introduced every year, usually bred by keen amateurs. Some of these new varieties quickly establish themselves as show winners but all will give a wonderful display in any garden. Traditionalists often complain that modern breeding has resulted in sweet peas with less scent. This is not entirely true. Many of the Spencer sweet peas are wonderfully fragrant but it’s a question of choosing the right varieties. As a general rule lighter coloured varieties are better scented than the strong colours.